Go to original pattern for design DROPS 170-27. 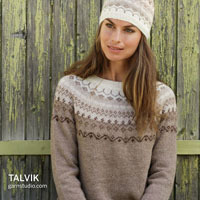 Knitted DROPS top with leaf pattern, ridges, round yoke and short sleeves, worked top down in ”Muskat”. Size S-XXXL. 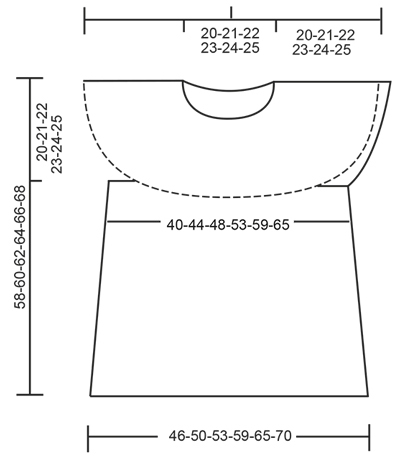 DROPS CIRCULAR NEEDLE (60 or 80 cm) SIZE 4 mm - or size needed to get 21 sts x 28 rows in stocking st = 10 x 10 cm. DROPS DOUBLE POINTED NEEDLES AND CIRCULAR NEEDLE (60 or 80 cm) SIZE 3.5 mm - or size needed to get 21 sts x 35 rows pattern (A.2) = 10 x 10 cm. Dec for buttonhole on band at the end of row seen from RS. Work until 4 sts remain. Make 1 YO, K the next 2 sts tog, work the last 2 sts on row. SIZE M: 2, 8, 14 and 20 cm. SIZE L: 2, 8, 14 and 21 cm. SIZE XL: 2, 8, 15 and 22 cm. SIZE XXL: 2, 9, 16 and 23 cm. SIZE XXXL: 2, 9, 16 and 24 cm. The piece is worked top down. Yoke is worked back and forth on circular needle with button band on the back, then work the body in the round. Cast on 89-95-101-113-125-131 sts on circular needle size 3.5 mm with Muskat. Cast off for BUTTON HOLES mid back - see explanation above. Work 5 sts in GARTER ST - see explanation above (= band), A.1 until 5 sts remain, 5 sts in garter st (= band). 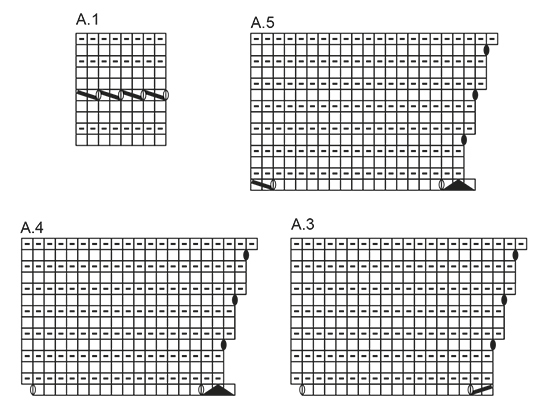 When A.1 has been worked 1 time vertically, continue as follows: 5 sts in garter st, A.2 (= 6 sts), repeat A.2 13-14-15-17-19-20 times in total, finish with first st in A.2 (so that pattern is the same in each side), finish with 5 sts in garter st. 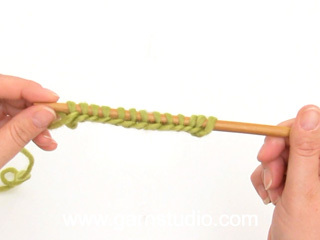 REMEMBER THE KNITTING TENSION When A.2 has been worked 1 time vertically, there are 245-263-281-317-353-371 sts on needle. Then work as follows: 5 sts in garter st, A.3 (= 17 sts), repeat A.4 11-12-13-15-17-18 times, A.5 (= 20 sts) and 5 sts in garter st. When A.3-A.5 have been worked 1 time vertically, there are 284-305-326-368-410-431 sts on needle. Continue in garter st until piece measures 20-21-22-23-24-25 cm, on last row from WS adjust no of sts to 283-307-331-365-397-429. 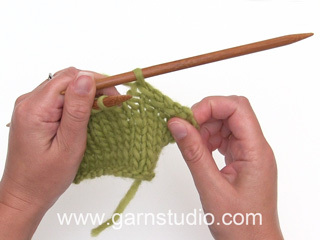 Continue to work as follows (from RS): Cast off the first 5 sts, work the first 39-43-47-53-59-65 sts (= half back piece), slip the next 61-65-69-74-78-82 sts on a stitch holder (= sleeve), cast on 6 new sts under sleeve, work the next 78-86-94-106-118-130 sts (= front piece), slip the next 61-65-69-74-78-82 sts on a stitch holder (= sleeve), cast on 6 new sts under sleeve, work the remaining 39-43-47-53-59-65 sts (= half back piece). There are now 168-184-200-224-248-272 sts for body. Insert a marker in each side of body where new sts were cast on under sleeve (= 3 new sts on each side of marker). NOW MEASURE THE PIECE FROM HERE. Switch to circular needle size 4 mm. Continue with stocking st, now work in the round. When piece measures 4 cm, inc 1 st on each side of each marker (= 4 sts inc). Repeat inc every 5-5-5-6-6-6 cm 5 more times = 192-208-224-248-272-296 sts. Continue in stocking st until piece measures 34-35-36-37-38-39 cm, switch to circular needle size 3.5 mm and work 3 ridges in GARTER ST - see explanation above. Cast off. The whole piece measures approx. 58-60-62-64-66-68 cm. 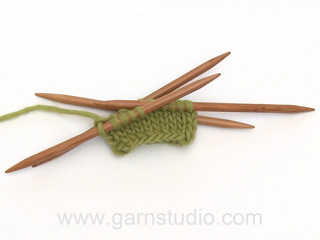 Slip sts from stitch holder back on double pointed needles size 3.5 mm (= 61-65-69-74-78-82 sts). Pick up 1 st in each of the 6 sts cast on under sleeve = 67-71-75-80-84-88 sts. Work 2 ridges in GARTER ST – see explanation above, then cast off. Place band without buttonholes under band with buttonholes and fasten the bottom band. Sew on buttons. Wil hier graag aan beginnen. Eerst goed doorlezen. Dan valt me correctie op: Correctie: tekst symbool nr. 6 en 7 Hier begrijp ik niets van. Wat wordt hiermee bedoeld? De correctie is al doorgevoerd in het online patroon. Als je het patroon voor 19-10-2016 hebt afgedrukt, druk hem dan even opnieuw af. Wieviel Wolle bräuchte ich mit Drops Nord, ein- oder zweifädig? Liebe Emelie, DROPS Nord gehört zur Garngruppe A und DROPS Muskat zur Garngruppe B, so daß Nord ist hier keine Alternative. Am besten suchen Sie die Modellen der Garngruppe A. Hier lesen Sie mehr über Garnalternativen und Gruppen. Viel Spaß beim stricken! Dear Mrs Catenacci, this might be possible, just make sure the neck will be wide enough to go over the head - should you need any assistance adjusting the pattern to your own taste please contact the store where you bought the yarn- even per mail or telephone. Happy knitting! Liebe Gisela, es gibt kein Photo von der Hinterseite, beide Seiten sind hier gleich gestrickt, es gibt hier nur dazu 5 Maschen kraus rechts für die Blende oben in der Mitte Rückenteil. Viel Spaß beim stricken! Hallo, wenn ich bei dem Model keine Knopfleiste machen will wieviel Maschen muss ich dann weg lasse? Denke mal 10 oder? Hi, Paula. 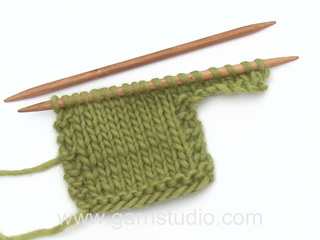 I am an experienced knitter but finding your Summer Leaves pattern to be challenging. I've completed the yoke (A2) but I can't seem to figure out the next set of instructions. Do I start at the bottom of each chart? I find this part very confusing. Any help would be appreciated. Dear Mrs Powel, after A.2 has been completed, work diagrams A.3 -A.5 as follows: 5 sts in garter st, A.3 over the next 17 sts, repeat A.4 a total of 11-18 times (see size), and finish working first st in A.2 (à so that pattern will be symetrical) and 5 sts in garter st. Always read diagrams starting from the bottom corner on the right side towards the left from RS and from the left towards the right from WS. Insert markers between each diagram to make sure you have the correct number of sts on each row. Happy knitting! Dear Annie, start reading diagrams from the bottom corner on the right side towards the left from RS (and from the left towards the right from WS), ie A.2 starts with 6 sts and you will increase by and by to 18 sts. Happy knitting! Liebe Verena, die Umschläge vor/nach den Abnahmen werden Krausrechts gestrickt. Viel Spaß beim stricken! Liebe Frau Stoeckli, nach A.2 haben Sie 245-371 M (siehe Größe), dann stricken Sie A.3 (= 17 M), A.4 11-18 Mal in der Breite wiederholen und A.5 (= 20 M) = 284-431 M nach A.3 bis A.5. Die Diagramme werden immer von unten nach oben gestrickt (auch beim top-down) aber alle auf einmal, dh, 1. Reihe in allen Diagrams stricken, dann 2. Reihe alle diagrams stricken usw. Viel Spaß beim stricken! Nadat ik via uw website garen besteld had, was ik met veel zin begonnen aan patroon "Drops 170/27" Alles verliep voorspoedig, tot ik merkte dat mijn cirkel geen cirkel werd maar meer een dubbele, (dubbel gelegd en toen was het geen halve cirkel maar bijna weer een hele) veel te groot dus. Ik heb precies de aanwijzingen gevolgd. Proeflapje heb ik ook gemaakt. Dat week minder dan een halve centimeter af. Waar gaat het fout? Uw advies graag! Hoi Paula, Als je hem dubbelvouwt, moet je inderdaad op ongeveer een halve cirkel uitkomen en niet op een hele. Helaas kan ik vanaf hier niet precies zien waar het fout gaat. Heb je het aantal steken dat je op de naald hebt, gecontroleerd? Vanaf de 16e naald in A2 komen er geen steken meer bij. Misschien heb je per ongeluk meer omslagen gemaakt dan in het telpatroon staat?